These humorous jokes are not just funny, they are bound to make you laugh for a long time. It’s no doubt that laughing is a great way to connect with family, friends, and loved ones and you can be sure to find some of these are real gems. Jokes, especially really humorous ones, not only makes us laugh, but offer many benefits that positively impact bodies and minds. We guarantee that the next time you’ve got an audience to impress, these jokes are sure to have everyone cracking up. 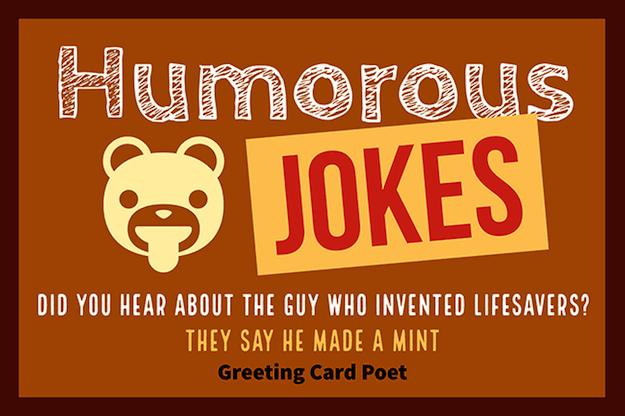 So, if you’re in need of a laugh, or are looking for something fun to add to your text message, email signature, or card, try using one of these funny jokes. How can you tell a good snack from a bad one? The good one always comes through when the chips are down. 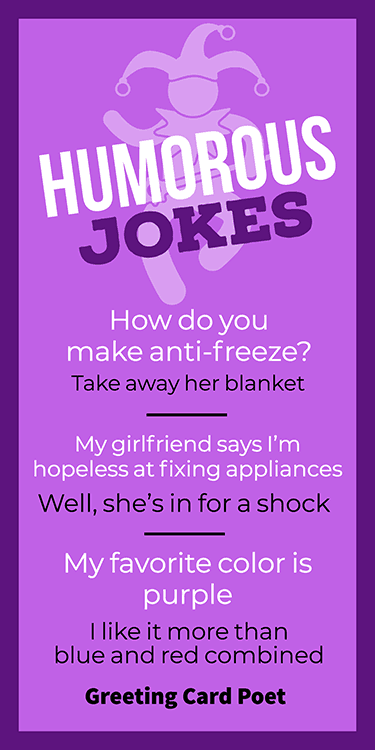 How do you make anti-freeze? What does a martial arts expert drink? What do you call a crab that plays baseball? Why can’t a bicycle stand up by itself? Not all math puns are bad. My girlfriend says I’m hopeless at fixing appliances. Well, she’s in for a shock. My friend has got a butler who only has one arm. I like it more than blue and red combined. A man showed up for a duel armed only with a pencil and paper. He then proceeded to draw his weapon. How did the beaver get online? Why did the one-handed man cross the road? To get to the second hand shop. If you take your watch to be fixed, make sure you don’t pay up front. Many people assume that humor is anything that causes laughter, but the important thing to remember is that humor comes in many forms. There really is no universally agreed on definition of it, but simply put it’s mostly anything that relaxes the body, gets people to breathe, causes a smile, or elicits happiness is humor. What was the average age of a caveman? Patient: Doctor, I get a strong stinging feeling in my eyes every time I eat a birthday cake. Doctor: Next time, blow out the candles. From a certain age, birthdays are like a reverse countdown. Well, Abby Birthday to you. What do you say to a kangaroo on its birthday? What is it about birthdays that make kangaroos unhappy? They only get to celebrate them in leap years. What sort of birthday cake should you eat during Halloween? Why do we put candles on the top of birthday cakes? Did you hear about the power outage at the college library? Forty students were stuck on the escalator for three hours. What do my college’s football team and pot have in common? They both get smoked in bowls. What does the average student at one college get on his SAT? What’s the definition of an optimist? A college student who opens his wallet and expects to find money. What kind of ships do students study on? Why was the geometry class always tired? Because they were all out of shape. As long as there are tests, there will be prayer in colleges. Who’s the king of the classroom? What’s a teacher’s favorite nation? Why was school easier for cave people? Because there was no history to study. Why did the boy study on an airplane? Because he wanted to get a higher education. I was caught studying the periodic table in English class…it was an elementary mistake. What did the pencil sharpener say to the pencil? Stop going in circles and get to the point. Due to their cemetery lifestyle. Why did the old lady go to jail? Because she stole a kilt and plaid guilty. Cleaning mud can lead to a life of grime. It’s a slippery slop. What do you call someone who steals flip flops? Don’t touch my elbow. Do it and I’ll have you charged with arm rubbery. What’s the most dangerous vegetable? Setting fire to a cemetery is an act of tomb fuellery. The mattress thief was cot in the act, bed-handed. What did the kid do when his scooter got stolen? Which way did the computer programmer go? Because he didn’t Node how to Express himself. What do you call 8 hobbits? Because he used up all his cache. What’s the best way to get by in computer class? Why did the computer spy quit? He couldn’t hack it anymore. What does a computer programmer eat for lunch? Why did the IBM and the Apple computers get a divorce? How did the computers buy a new car? Where are delinquent disk drives sent? How do you find a spider on the internet? Why did the maid refuse to clean the computer? Money talks…but all mine ever says is good-bye. How do you keep your dreams alive? By hitting the snooze button. I bet you I could stop gambling. With a calendar, your days are numbered. If you need so much space, there’s always NASA. What kind of coffee was served on the Titanic? I was wondering why the baseball coming towards me was getting bigger…then it hit me. He’s lucky it was a soft drink. A small boy swallowed some coins and was taken to the hospital. I did a theoretical play on puns…really it was just a play on words. If towels could tell jokes they would probably have a dry sense of humor. You’re on Humorous Jokes page.